For the Game Boy Color bootleg, see Keitai Denjū Telefang. Pokémon Diamond and Pearl begin Generation IV’s entries in Nintendo's popular Pokémon series of monster-battling RPGs. 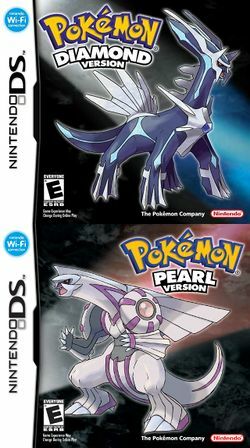 Diamond and Pearl are the first core games in the series to appear on the Nintendo DS. Diamond and Pearl carry on the series with all the usual aspects found in Pokémon games, but wrapped in a new package of bright new, partially three dimensional graphics and spectacular attack animations. Diamond and Pearl follow in the footsteps of the previous Pokémon games and very few times do the games stray from those worn footsteps. Those few times DP stray from those worn footsteps include new, completely overhauled Pokémon contests, the vast underground network and new Wi-Fi features. It was succeeded by an enhanced remake, Pokémon Platinum, in 2008. This page has been accessed 383,583 times.